Are you worried about seeing the dentist? Are you confused about discussing your smile? In addition to the fact that we offer sedation dentistry, settling into the reality of what you are prepared to discuss with your dentist is the first step to relief. The next step is making a choice. As you sift through the choices and pick the right dentist in Anchorage, Alaska keep in mind that Excellence In Dentistry offers competitive pricing and affordable options. The reality is that we service the Southern Alaska, Wasilla, Palmer areas with pleasure and look forward to treating your dental concerns with accuracy, gentleness and care. The final step to relief is just smiling. 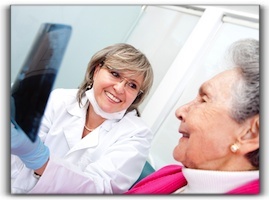 We’d like to take care of placing dental implants or cosmetic dentistry or restoring smiles for you. And we are certain you’ll walk out the door smiling.